CHARLOTTE, N.C. - Aug. 11, 2014 - PRLog -- Clayton Mann, and his twin brothers Johnathon and Bryce Mann, better known as the Chicago rock band REBELMANN, will be performing on the Teen Nation Tour, starting September 22 in North Carolina. Simply hashtagged #TNT on popular social media sites, a new generation of young, talented artists will deliver powerful anti-bullying messages to student bodies as they travel across the country. Through artist talks of personal experieces, the Teen Nation Tour delivers a one-and-a-half hour, power-packed, musical program that now has students on social media sites requesting the tour stop in their town, thus confirming the anti-bullying message is resonating with their peers. 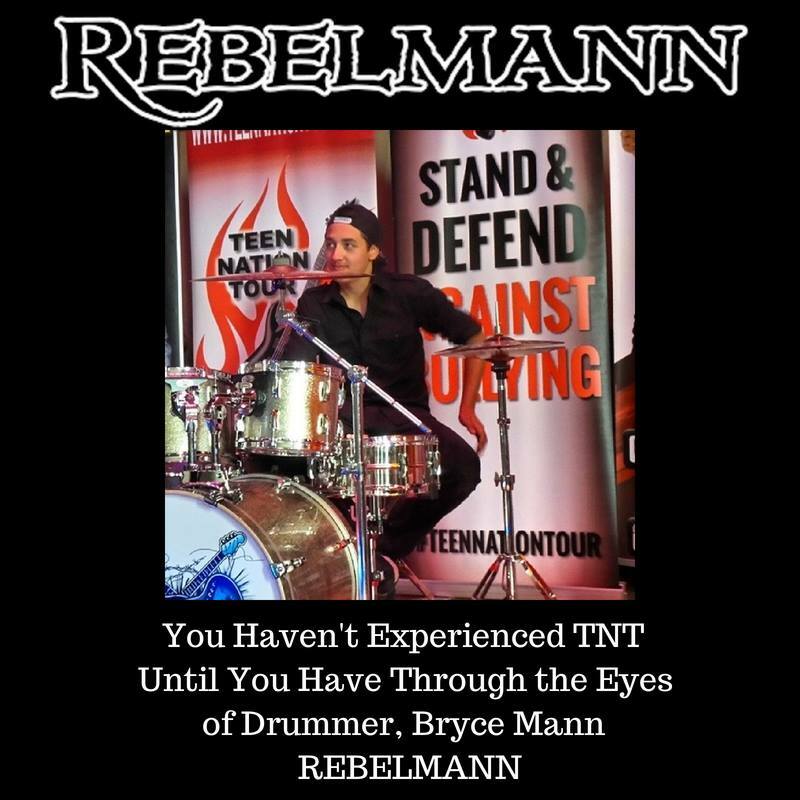 Clayton Mann, 14, and lead singer of REBELMANN, personally identifies with the #TNT format. "Kids our age respond much better to us, as artists' their age, rather than someone older, say 33, talking at them about something they're not really going through." His older brother, Bryce Mann, 17, who happens to be wildly popular with the students on Teen Nation Tour, chimes in. "Cyber-bullying is nonstop. Because of the internet, kids just can't get away from all the hate once school is out. We're here to tell them, 'Not everyone is going to like you, and that's OK, because you're OK.' But you have to be strong enough to love yourself, and not really let what others say get inside your head. There will always be someone who hates you, or hates what you do. I've been hated for drumming, for not playing sports, for being in a band, for playing live music. But you know what - they're not going to stop me. This is what I do. I like what I do. I'm good at what I do, and I'm going to keep doing it. There's only one person who can stop you - and that's you. That's the message we bring to Teen Nation Tour. So we're here to help give kids confidence in themselves. Be who you are, and be OK with that." Johnathon Mann brings his message to Teen Nation Tour through a different medium, his guitar. 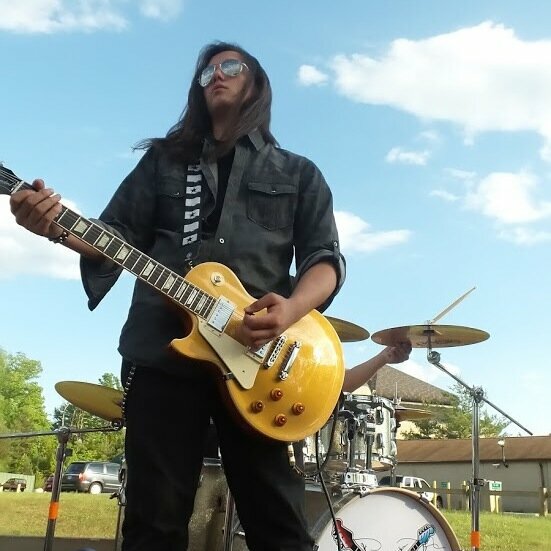 With his mirrored sun glasses and lush, long hair, the lead lefty guitarist is known to play fast and furious on his gold-top Gibson Les Paul. Not as verbose as his twin, Bryce, Johnathon mesmerizes the students with his guitar skills, as a red-tail Hawk feather sways from his guitar head - a gift from the Navajo. As he bends his guitar strings into the next stratosphere, Johnathon also knows the sting of being bullied. 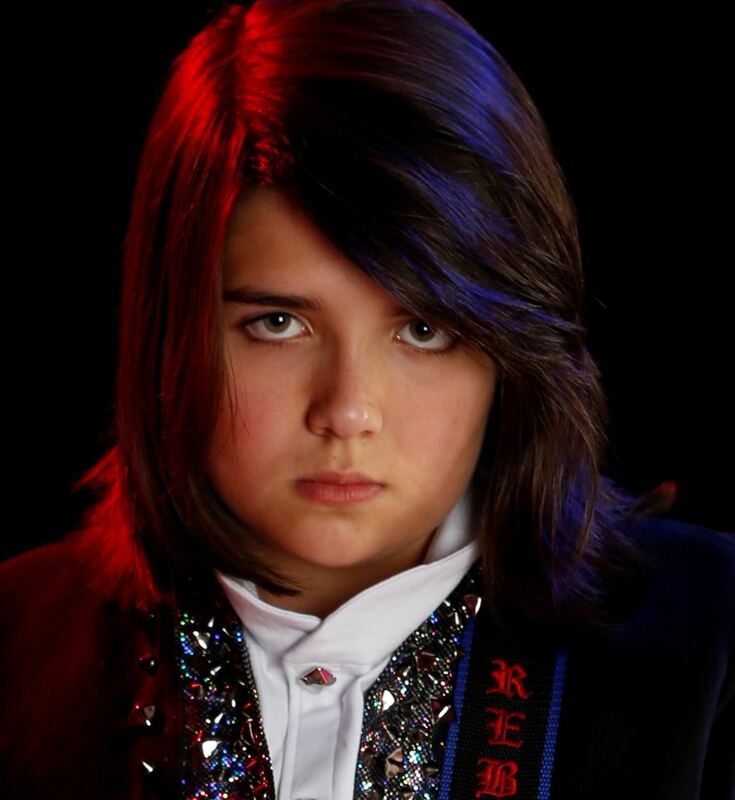 His long hair has brought many comments of hate, his guitar skills challenged, his band - put down. But he chooses to march to the beat of a different drummer, or at least to the beat of his twin, Bryce. Johnathon's message to the student body is simple, "Keep doing what you're doing. There are 7 billion people in the world - if someone hates you - that's only one person - seriously, just keep marching." The Teen Nation Tour has been delivering messages of anti-bullying for 3 years now. As the tour continues to travel nationwide, it has gained much popularity amongst the schools and student bodies it serves. Throughout the year, #TNT receives many messages of gratitude from both administrators and individual students. 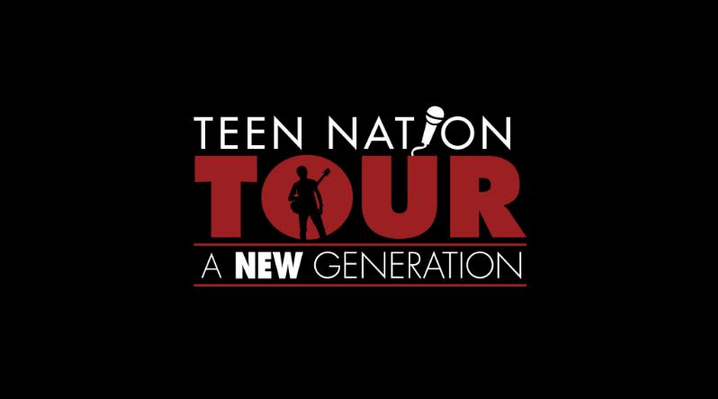 In addition to the weekly school performances, which typically are scheduled twice daily, the Teen Nation Tour also performs weekend shows at various venues throughout the tour. Be sure to follow #TNT, and the #NextGeneration of artists, as they kickoff their schedule August 28th in Huntington, West Virginia. Who Do You Think You Are, Telling Me What To Do?